Hello, you've just found one of the most popular children's entertainers in Birmingham and the West Midlands - Andy's Magic - who's got some great birthday party ideas. Celebrating over 25 years as a professional Kids party entertainer and magician Andy has performed at 1000's of birthday parties and events. Andy's unique style of colourful, comedy magic shows and fun has made him one of the most popular over the years and he aims to make every party as memorable as possible. His funtastic disco is action-packed with loads of games and prizes, bubbles and fun and really is one of the best birthday party ideas. His magic show will have the kids in fits of laughter and leave them gasping with amazement. 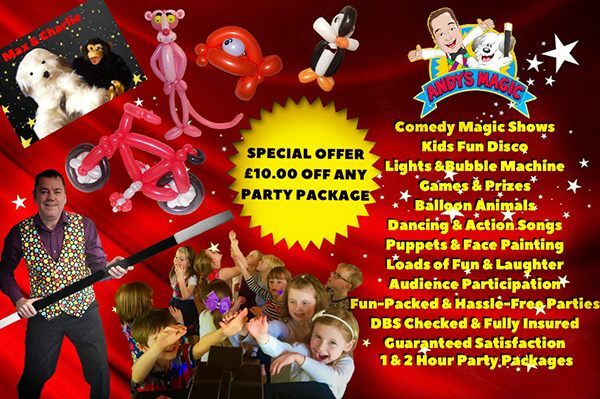 Add the Face Painting, his adorable puppets, Charlie and Max, and Balloon Animals for all the kids at the party and you've got a complete entertainment package any child will love, it'll make your party hassle-free and leave great magical memories for everyone too.